coraline and cat. . HD Wallpaper and background images in the Coraline club tagged: coraline animated film neil gaiman movie poster. 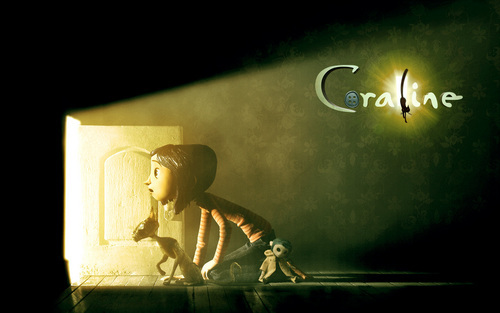 This Coraline wallpaper might contain phòng khách, phòng sinh hoạt, phòng phía trước, phòng sinh hoạt chung, phòng, phòng trước, tiệm, dấu hiệu, poster, văn bản, bảng đen, and ký hiệu. i love coraline and the cat! Most people who like Coraline can find hundreds of incidents that match what happened in their own backyards growing up, that's part of the beauty of the story line, most everyone can relate. Infact I would say that each fan feels like they could have been the model for the star of the show. Wacky neighbors and creepy kids. For me it's literally the whole scene including the parent at the piano too busy being too busy and lots of time to invent problems to get into and dreaming about what's behind locked doors. The cold winter, changing schools and moving or wishing for a whole new life when that one wasn't too boring to start. Even the clothes, the moody garden and scene settings. What a cool movie. Thanks for submitting the photo. Not too many people say that and should. Very cool for those who don't have the technology to share.